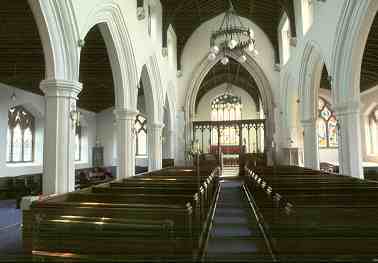 The interior of St Mary's church in Wymeswold is, in almost every respect, a 'typical' English parish church. Rows of pews, a pulpit set to the side of the chancel arch, choir seats flanking the chancel, and an altar table at the far east end. This layout epitomises what we think of as a parish church. Yet at the time A.W.N. Pugin designed this church interior in the mid-1840s such an arrangement was quite radical and almost entirely novel in the county. 'Ecclesiology' had become manifest in Leicestershire. This article attempts to provide a summary of these pioneering national ideas and show how the restoration of St Mary's influenced restorations throughout the county. The style gurus of the Gothic revival came together in 1839 to form the Cambridge Camden Society (CCS). Soon after its formation the CCS published a list of do's and don'ts for church layout which they promoted as a science, dubbed ecclesiology, with rules that should not be broken. These rules were based on a revival of Gothic architecture that Pugin was already pioneering both in his buildings and his influential books. The aim was to invoke the splendours of the medieval churches and cathedrals, although without 'Popish superstition' and idolatry. In Contrasts (published in 1836) Pugin contrasts images of the noble Middle Ages with 'degraded' contemporary ones. For him Gothic expressed 'all we should hold sacred, honourable, and national.' The freshness and vigour of Pugin's Gothic designs were understandably imitated by his contemporaries, although his death at the age of 40 in 1852, meant he did not live to see the extent to which his ideas dominated architecture in the second half of the nineteenth century. There is a deep underlying irony here. By this time Britain was the most prosperous country in the world, leading the way with industrial and agricultural innovations. At the time when railways were revolutionising the speed and ease of transport, the favoured style of architecture harked back over five hundred years. This remarkable chink in the apparently overarching self-confidence of Victorian Britain led to public buildings, from the humblest of parish churches through to the House of Commons, being designed not in a new modern manner as might be expected but in imitation of medieval Gothic. The reason for this derives from the nature of the Reformation in England. Whereas in many European countries the Reformation had led to a total break with previous religious traditions, in England the formation of the Church of England under Henry VIII retained rather more continuity. Rather than being deprecated, medieval ecclesiastical architecture came to have rather 'romantic' associations. By the early nineteenth century England was associating the Gothic style with a noble, idealised past. Even if the early stages of the Reformation in England were more evolutionary than revolutionary, in succeeding centuries the liturgical practices of the Church of England evolved significantly. By the eighteenth century the practice was for communion to be celebrated no more than three or four times a year. People went to church to listen to the preaching; the main focus of the church was not the altar but the pulpit. This often stood at the east end of the nave, blocking the chancel arch. The congregation sat within the confines of box pews, which were rented out and embodied the 'pecking order' of the local families. Sometimes the pews were arranged 'collegiate style', that is, facing each other. At the west end a gallery, often intended for singers or musicians, was typical. Roof spaces were usually concealed behind plastered ceilings. In Leicestershire this arrangement has survived almost unchanged at Wistow and Kings Norton, two quite different churches that in their distinctive ways are representative of eighteen century church interiors. The CCS abhorred these interiors. They represented everything that was 'ungodly' about services based on preaching. The Oxford Movement, with its emphasis on a liturgy based on the celebration of communion, might have seemed overly-romantic, even 'Anglo-Catholic' to its critics, but in the 1830s and 40s it was gaining support. At this time any changes that would help get more people into the churches was welcomed. What could not have been expected in the 1840s was how the ideas of the ecclesiologists and the 'Anglicans' would change both the layout and the liturgy of nearly every parish church in the country. The Gothic emphasis on 'heavenward-pointing' columns and arches had, by the early part of the nineteenth century, come to be associated with profound religious thinking. By the 1830s there was a good understanding of Gothic architecture. The style especially favoured by the revivalists was dubbed 'early Middle Pointed', that is the Decorated style of about 1300. Careful copying was encouraged while 'inventive innovation' was condemned. CCS publications criticised church restorations and rebuilding, often making harsh overall assessments based on pernickety deviations from their ideals. Yet the layout of the 'idealised' Gothic church, with chancel, side aisles and high open roofs fitted poorly with the liturgical requirements. What made sense in the fourteenth century did not make sense five hundred years later. Side aisles were originally constructed to house side altars, which were not wanted; they were not constructed to allow easy visibility into the chancel. The problem of how to fill the chancel, apart from putting the altar at the east end, was resolved only in the later part of the nineteenth century when choirs became customary. The high open roofs lead to stylish interiors but defeat all attempts at effective heating. But the CCS promoted these idealised Gothic interiors so successfully that by the 1890s they had all-but swept away the various changes that had evolved between the fifteenth and seventeenth centuries. Anyone who browses through John Nichols' History and Antiquities of the County of Leicester cannot miss the illustrations of every parish church in the county. These were drawn in the late eighteenth century and are very much a 'warts and all' depiction of their state. An air of dilapidation pervades many of these engravings and, in some cases, either the nave or the chancel is roofless. In truth, at the time about half the churches of Leicestershire were in good repair and of the rest only about twenty needed major structural work. The first major restoration of any Leicestershire church in the nineteenth century took place between 182932 at Appleby Magna. The churches at Burbage, Norton-juxta-Twycross, Chilcote and Countesthorpe were partly rebuilt in 1842. All these incorporate aspects of the Gothic revival but none make a clean break with eighteenth century interior layouts, and the copying of Gothic decoration is often somewhat heavy-handed. Despite the widespread influence of the CCS, only two people in Leicestershire joined. One was Henry Alford, vicar of Wymeswold from 1835 to 1853. He joined the CCS in 1844, the same year that he commissioned the leading 'idol' of CCS ideals, Pugin, to restore St Mary's church. Alford's involvement with the CCS fits well with his close connections with Cambridge. Then, as now, Trinity College in Cambridge was the patron of Wymeswold church. Alford was a Fellow of Trinity, which is why he came to be vicar of Wymeswold. Presumably he encountered the CCS as a result of his close connections with Cambridge; indeed the CCS seemed to have especially intimate links with Trinity College. With Pugin's appointment in 1844 to restore St Mary's at Wymeswold ecclesiology and the Gothic revival arrived in the county 'fully formed'. Pugin had already rebuilt a number of churches in the Gothic style during the 1830s and, at the time of working on St Mary's, was producing thousands of drawings for the decoration of the new Houses of Commons, which were being rebuilt by the architect Charles Barry. "Work began with rebuilding the south aisle, the removal of the gallery, and brick wall blocking the tower arch. The style was Decorated and is an interesting mixture of copyism and invention. The aisle windows were based on work in the finest Lincolnshire churches. Pugin's design for the lavish north porch is freer but still within the authentic medieval idiom. A small 'chapel' was added on the north side of the chancel for an organ and is believed to be one of, if not the earliest, such organ chambers on a Victorian church. The fittings throughout were to Pugin's designs, even down to the binding of the Bible and the wall-mounted candle-sconces with their reflectors. The finishing touches were the painting of the chancel roof and a set of texts carefully chosen to suit their position." The painted wall texts were victims of the 19559 restoration but  if it is possible to ignore the overly-obtrusive ceiling fans installed in the 1990s  in other respects the church is essentially as Pugin intended. The next church in the county to be restored was at Anstey, where work took place between 18456. Intriguingly this very competent use of the Gothic revival style was by the local building firm, Broadbent and Hawley. The appearance of the interior at Anstey suggests that the work at Wymeswold provided considerable inspiration. Henry Alford celebrated the completion of Pugin's work at Wymeswold in 1846 with a book detailing Pugin's visionary designs. There can be little doubt that this volume found its way into the hands of clergy, churchwardens and architects throughout the county and helped to inspire the desire for restoration in the Gothic style. From the 1840s major restorations and rebuilds swept through the county, peaking in the 1860s with thirteen to seventeen churches in Leicestershire being worked on at any one time. Most of the necessary work had been done in this area by the end of the 1890s. By the 1890s the interiors of most churches resembled what, just fifty years before, had been the radical approach which Pugin had manifested at Wymeswold. St Mary's was now 'typical' rather than innovatory. Anon. [H. Alford], History and Description of Wymeswold Church, c.1846. Geoffrey K Brandwood, Bringing them to their knees: Church-building and restoration in Leicestershire and Rutland 18001914, Leicestershire Archaeological and Historical Society, 2002. John Glen Harries, Pugin, Shire Publications, 1994. Published in 2000 Years of the Wolds 2003.